If you are a prospective homebuyer in Peoria, Arizona, looking for a gorgeous home in a gated community that boasts breathtaking mountain views, then look no further than Westwing. Westwing is an ideal destination for people that love hiking and other kinds of outdoor recreation. When you buy a home in Westwing, you’ll be just steps away from Sunrise Mountain and Westwing Mountain, as well as the glistening waters of Lake Pleasant. Surrounded by this abundance of picturesque natural beauty, you may forget that you are conveniently close to the freeway, as well as excellent shopping, dining, and entertainment options. You’ll find the magnificent Westwing Mountain Home community nestled in the valley between the Sunrise and Westwing mountains. The beautiful homes here typically range in size from around 1,500 to well over 5,000 square feet and have been constructed by a variety of highly-esteemed builders. The community was first developed in 2002 and was built out by 2006, however in the gated sections of the community, there are still opportunities to build your own custom dream home with a breathtaking mountain view. Westwing is only one example of the many outstanding real estate options found within Peoria. This vibrant desert city is full of impressive residential communities, as well as delightful amenities and attractions. There are good reasons why Peoria made Money Magazine’s list of the top 100 places in which to live. 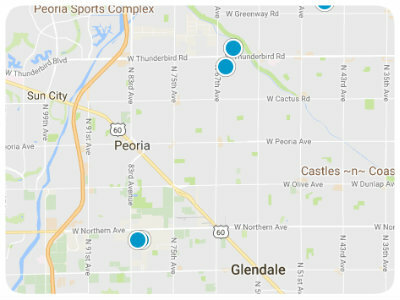 If you are searching for a charming small-town atmosphere with warm weather and big city conveniences, you would be remiss not to consider buying a home in Peoria. For more information regarding homes or lots for sale in Westwing, please do not hesitate to contact us today.